Attention all visitors: Tartans.com is back. Please check back over the next few months as we work to restore and upgrade the site. 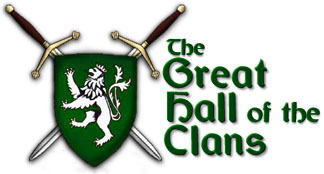 In the meantime, you can browse the Great Hall of the Clans below - or browse the original site at Archive.org. Alphabetical list of Clan and Family discussion areas. NOTE: If you are a Clan Society official and your Society would like to take advantage of a free Web site, please contact The Gathering of the Clans Webmaster. Lennox	-- Dunbartonshire, Renfrewshire, Stirlingshire, Perthshire. Menzies -- Meyners, Mengues, Mingies. Skene	-- Dyce, Halyards, Cariston, Curriehill, Rubislaw. Stewart/Stuart -- Galloway, Atholl, Appin, etc.